I’ve been a trout angler for as long as I can remember. Some of my earliest childhood memories are of my father taking my brothers and I to the lake. Our day would start early and we would get right out of bed. Even though we were tired it was an easy rise, because we knew what the day had in store for us. All fisherman know the pre fishing ritual, we all have one. Ours was probably not unlike anyone else. We would stop at the Estacada Tackle store where dad would buy us each a chocolate milk and a package of hostess donuts, while he bought worms and chatted with the man behind the counter about the days prospects. After that it was go time. My father would have our rods all rigged up, and ready to go. We liked to frequent North Fork Reservoir, where usually we would fish from the bank, but on occasion rented a boat for the day. To be completely honest I have no idea what our success rate was because, the memories that lasted were the ones I’ve described, and ones of getting along with my brothers for the day (a rarity when we were young.) I know we caught fish, and that was always exciting, but it was breathing the fresh morning air, watching the sunrise, spending the day on a lake, and eating a sandwich from a little cooler for lunch that stick in my mind. It’s what keeps me heading back to the lakes and rivers today, the nostalgia. Even though fishing is a sport that changes dramatically with new innovation every year, there is something so classic about it, something that never changes. Fishing is like a time machine. While you are on the bank casting your line waiting for the tug, you could be anywhere in history since the advent of the rod and reel, and the experience is essentially the same. Add all the latest and greatest gear, and fancy gadgets, you still can’t change the nostalgia. I often think about who may have stood before me in the exact same spot in the last 100 years. Knowing that the feeling of adrenaline shooting though the body and the excitement of battle was the same for them. Sure, they were using gear that would likely be a horror to us now, but damnit, it got the job done, in fact it would still get the job done. We all get excited about the latest and greatest gear, spending too much money on it, but when we get down to it, the nostalgia is what keeps us coming for more. Catching fish is nice too, but if that were the only draw, this would be a miserable sport for most of us. This year I discovered a new part of an old love, salmon fishing. It’s not that I was unaware of it. In fact, I purchased tags for probably the last five years with nothing to show for it. The difference this year is that I caught one. It was August 6th, and it was a beautiful summer morning. I promised to take an old friend fishing as he had seen some pictures of the trophy trout I had been catching up near Mt. Hood. We were strapped for time so we decided to try for salmon. Neither of us really had much of an idea what we were supposed to do but I had been told that Blue Fox spinners work well. We armed ourselves with a few and headed out to a spot my father recommended. He had told me about this spot many times, it was where he caught his first Steelhead. It was like a legend to me, and finally I decided to see for myself the magic of this hole. The hole was on the upper reaches of the Sandy River somewhere before the confluence with the Salmon River. We didn’t get on the river super early, the sun was already up. We started hucking lures, and spent most of our time trying to loosen them from snags in the rugged and rocky portion of the river. That continued for about an hour until one of the rocks tugged back. My heart stared beating fast, and I felt like I was floating on a cloud. It was the most intense “fish on” I had ever experienced. I had my first salmon on the line, or Steelhead, or maybe a big trout. I really had no idea, I just knew it was big. It ran a few times and kept diving, going up and down the river. It broke the water a few times, and after a nearly 10 minute battle I brought it in for my friend to net. It was a native spring Chinook I got some pictures out of the water, which I would never do now, but it was a first so I felt it was justified. I spent some time reviving it and let it swim away. I was still on cloud nine. I didn’t weigh or measure the fish, but I estimated it at around 15 lbs. Turns out I was wrong. It wasn’t until later, when I caught a few and weighed them in the 15-20 lb range, and showed the picture to some more experienced anglers, that I realized that first fish was a hog. I would estimate now that it was probably more like 30 pounds or more. That monster fish is the reason I am addicted today. Since then, I’ve caught a number of salmon. The first one I was able to tag was in late September at Barton Park, a six pound coho. The fight wasn’t remarkable, in fact I was very surprised at how easily it came in, but the excitement was still there. Once I saw that I had a fin clipped hatchery fish on my line I dragged it on shore. I finally had some excellent table fare to take home to my wife. People came to ask about my fish as I told them it was my first, with a grin ear to ear. I cast my spinner a few more times, but could hardly contain my excitement, I had to get home and show it to my wife. After a quick photo shoot, I processed it. It cut beautifully, and that evening I had one of the best salmon meals I’ve eaten in my life. Out of the water for less than 12 hours, I cooked it on a cedar plank. The combination of the freshness, one of my favorite grilling recipes, and the fact that this was my catch, made that fish so succulent and delicious. That night I slept easy, with an enormous sense of accomplishment. Though I didn’t know it from that first coho, people told me they were a great fighting fish. 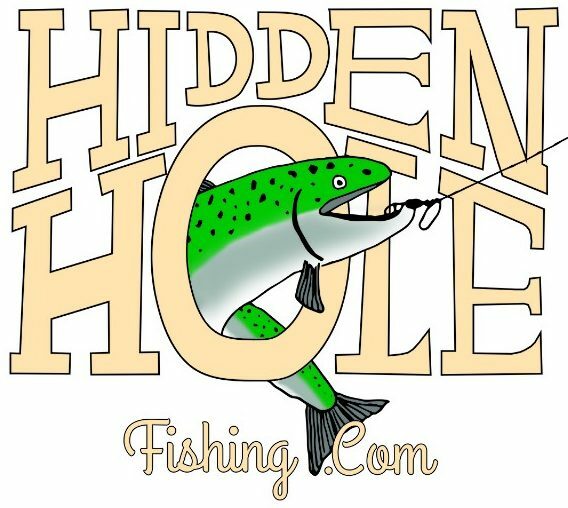 I would later find this to be true, as I had a great coho season, filling my freezer with salmon and eggs. The rest of my coho were larger, the biggest one being an unclipped 14 lb buck, who gave me my most recent battle. My friends and family have seen what was once a casual hobby for me, slowly grow into an obsession over the last few years. This years success with salmon has propelled my obsession to new heights. Fishing everyday before going to work for 10 hours, fishing after everyone leaves the hole, and being persistent has paid off for me. It is an addiction like any other, but probably more healthy than, and not as destructive as drugs. As this coho season fizzles out, it has me starry eyed looking forward to winter Steelhead, hoping I can hook into my very first one. This has already been a phenomenal fishing year for me, and a Steelie would be the cherry on top. It has been a year that will strengthen the nostalgia that I have for this sport. This year (the year my daughter was born) was by far my greatest year for fishing ever. I have pictures and videos that will stir those feelings in me probably for the rest of my life. Even though my dad doesn’t go fishing very often these days, I will always think about him while I’m fishing. In that same respect I can’t wait to share these experiences with my daughter, and hopefully create a lifetime of cherished memories. Casey, Very nicely written stories. I can feel your passion in the reading. Some of the great pleasures are simple ones. I get on FB occasionally and stayed on long enough to find this post today. Maybe we can do some fishing during our late April trip to Portland. Wading may not be feasible for me. Tell me about the technical details of the fishing poles you catch these fish on. God bless you and your family. Happy New Year. Fred Bangeman Hi, Jordan. Thanks for the comment uncle Fred! To answer your question, I use a variety of rods. 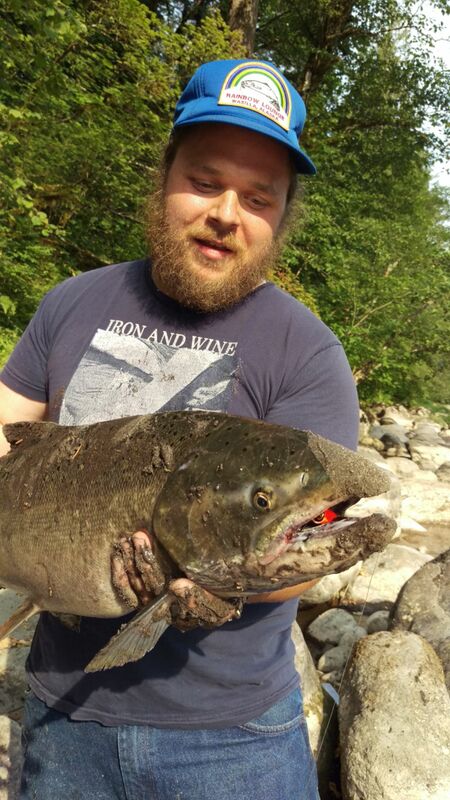 I have an 8′ 4″ Eagle Claw rod that I had found at a garage sale, That gave me my first Salmon. Since then I have made some upgrades. 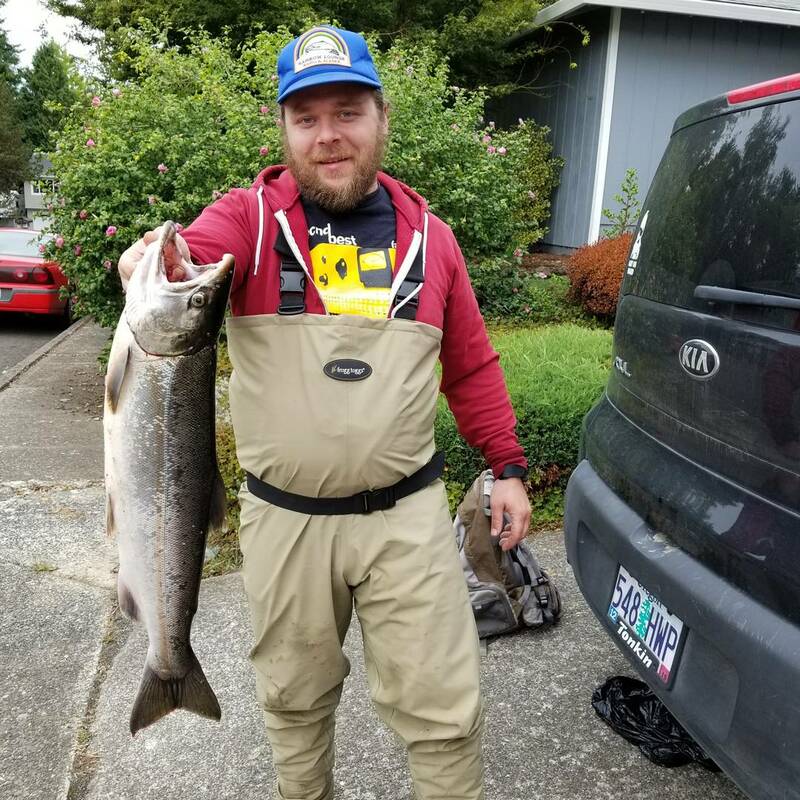 My final Coho of the season was caught on a Lamiglas Redline 9′ 4″ medium-heavy action spinning rod, rated to handle 10-20 lbs. I recently purchased another rod for Steelhead fishing. It is a Lamiglas X-11 10′ 6″ medium-light action spinning rod, rated for 6-12 lbs. April would be a great time to hook up with a Chinook Salmon. There are a couple of spots close to my house that are great for bank fishing, where it is not necessary to wade in. If you are interested, I would gladly take you out. I have all the gear we need, but of course a license and tags would be needed. Great to hear from you, and can’t wait to see you and aunt Barb when you visit.